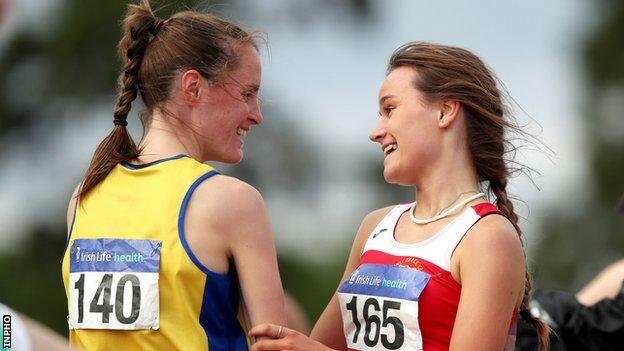 Ciara Mageean earned 800m and 1500m titles within the space of 75 minutes at the Irish Championships as sprinter Leon Reid also completed a double. Mageean followed a routine 800m success by winning one of the races of the weekend as she came in ahead of Amy O’Donoghue and Emma Mitchell over 1500. “I’m really happy. This is the last hard weekend before the European Championships,” Mageean told RTE Sport. Commonwealth Games medallist Leon Reid added the 100m title to his 200m win. After clocking 20.74 seconds on Saturday to edge out Carlow talent Marcus Lawler in the 200m, Reid’s 100m performance was arguably more impressive as he won in 10.42 seconds – 0.08 seconds outside his personal best – despite running into a headwind of over 2 metres per second. The conditions were unfavourable for sprinting but Reid showed that he is maintaining the kind of form that won him his Commonwealth bronze medal in April as he expectantly waits to get the all-clear this week to represent Ireland at the European Championships. An IAAF decision last week to remove the bar on all international transfer appeared to move the Bath-born athlete a significant step closer to his cherished ambition of running for Ireland. Reid is now hoping that his re-submitted application, stuck in limbo for nearly 18 months, can be processed and accepted in time for him to compete in the Berlin championships which start on 7 August. “I’ll be there,” said Reid, 24, when asked of his prospects of racing in Berlin. Reid’s 100m time left him 0.13 seconds ahead of Tralee athlete Travane Morrison with last year’s champion Jeremy Phillips a further 0.01 in arrears. Mageean is also focusing on a European Championships challenge after a thoroughly satisfactory weekend which saw her run four races at Santry. With Claire Mooney opting out of the 800m to instead clinch the 400m title, Mageean never looked likely to be threatened in the two-lap final and so it proved as she took a dominant victory in 2:07.93 which left her well ahead of Maisy O’Sullivan (2:09.18). With defending champion Emma Mitchell, Siofra Cleirigh Buttner, Kerry O’Flaherty and Amy O’Donoghue all involved, the 1500m looked a tougher proposition for Mageean but the 26-year-old kicked away with 150m left to win in 4:22.47. After a very slow opening 300m, steeplechase Olympian O’Flaherty attempted to inject some pace but all the notables were in contention at the ball. US collegiate star Cleirigh Buttner had been tipped to be Mageean’s main challenger but could only finish fourth as defending champion Mitchell (4:23.38), the 5,000m winner on Saturday, held on for third spot with runner-up O’Donoghue 0.61 behind the winner. O’Flaherty, hoping to earn Berlin selection in her specialist steeplechase, took fifth 4.52 seconds behind Mageean. After winning a surprise 1500m bronze in Amsterdam two years ago, Mageean knows what’s involved in winning a European Championship medal but the Portaferry woman is not making any bold predictions about what she can achieve in Berlin. “The 1500m is a loaded event (in Europe) but I will go there and try and do my best for country as I always do,” said Mageean, after earning the first women’s 800m/1500m double at the championships since Sonia O’Sullivan achieved the feat in 2000. 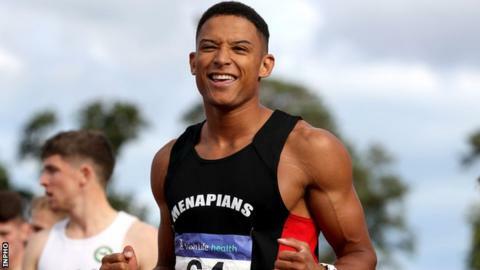 Another Northern Ireland Commonwealth Games competitor Adam McMullen retained his long jump title although the windy conditions prevented him from getting near the eight-metre barrier as he won in 7.68m. Another Gold Coast team member Ben Reynolds was beaten in the 110m hurdles as his time of 14.15 seconds left him 0.10 behind Carrick-on-Shannon’s Gerard O’Donnell. Letterkenny man Mark English held off a strong challenge from 2017 European Junior bronze medallist John Fitzsimons (1:51.05) to win the 800m title in 1:50.82 with Annadale’s Conall Kirk (1:51.72) taking third spot. There was also a third place for Ballymena & Antrim’s Craig Newell (48.16) in the 400m won in Brian Gregan’s absence by North Sligo’s Chris O’Donnell (46.92) with Northern Ireland man Andrew Mellon a non-starter because of a hamstring injury. Notable wins included Thomas Barr’s eighth straight 400m hurdles title in a championship record of 49.56 as the Waterford man continued his return to form in advance of the Europeans, with Jason Harvey taking third spot. The women’s 100m saw world under-20 relay silver medallist Gina Akpe-Moses edging out Joan Healy by thousandths of a second as she won in a blanket finish in 11.86 with Niamh Whelan and another of the Tampere squad Molly Scott both clocking 11.88.